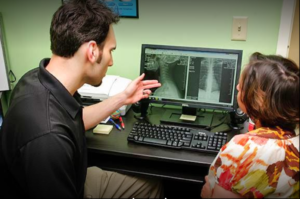 The Sandez Chiropractic Wellness Model of Chiropractic Care consists of 5 PILLARS OF HEALTH. 1. Neurological Health — Chiropractic care improves the connection between the brain and body, restoring proper nerve signals and improving organ/muscle function. 2. Nutrition/Supplementation — This is the fuel and energy necessary for life, the key is decreasing toxicity in your body and addressing deficiencies in your diet. 3. Regular Exercise — Some form of physical activity that gets you moving is critical. Benefits are endless from anti-aging to bone and cardiovascular health. 4. Adequate Rest — It is a well-known fact that during sleep and relaxation our body restores and repairs itself best. We sleep about 1/3 of our lives for good reason. 5. Mental/Spiritual Health — Create positive mood and energy. The power of the mind is limitless. Surround yourself with the right people, manage stress, believe and have faith. Whether you want relief of your pain/symptoms, correction of the cause of your pain/symptoms, maintenance of health, prevention of disease or lifetime wellness, chiropractic care and the 5 Pillars of Health can make a significant difference in your life. Let Sandez Family Chiropractic & Wellness Center lead you to the top! 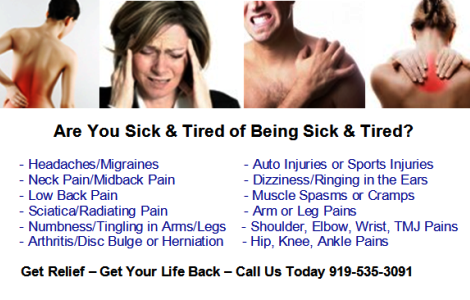 Please contact us by phone at 919-535-3091 or by filling out our Online Form to the right. If you live or work in Cary, Morrisville or the Research Triangle area, we welcome the opportunity to improve your health and make a difference in your life. No referral is needed to make an appointment. Most insurances are accepted and we will file for you!